Oil-Rite Corporation product can be found in a small machine shop or assembled onto thousands of off-road heavy vehicles. This involves both a meticulous and creative approach to devising product for use in a wide variety of applications. Below are examples of how customers have put Oil-Rite lubrication equipment to use. Ultra-Micro® PurgeX® dispenses 10% of the volume of standard PurgeX®. This very small amount (.0012 cubic inches or less) is making a big splash in many different industries. The need to precisely control the level of dispensing is driven by increasingly intricate machinery and higher standards of cleanliness. The goal is to distribute the minimum lubricant requirement over the longest amount of time, thereby reducing overall friction and eliminating waste. The automotive industry relies on robotics to accomplish detailed assembly. Ultra-Micro® PurgeX® is used to lubricate assembly machines and conveyors in auto plants in the U.S., Japan, and China. Synthetic lubricants are known for their eco-friendly properties and refined blends. Manufacturers of synthetic lubricants often recommend and even supply Ultra-Micro® PurgeX® to their customers. Synthetic lubricants are fed, for instance, in minute quantities through the tip of a metal cutting tool. This process eliminates the lubricant bath while improving the quality of the machining. This has become known as near dry machining. The challenges of lubricating increase where heat is a factor. Not only does heat contribute to the amount of friction, it can also quickly break down oil and grease. Oven manufacturers rely on Ultra-Micro® PurgeX® to keep lubricant strategically placed and replenished on chains, rollers, and conveyors. 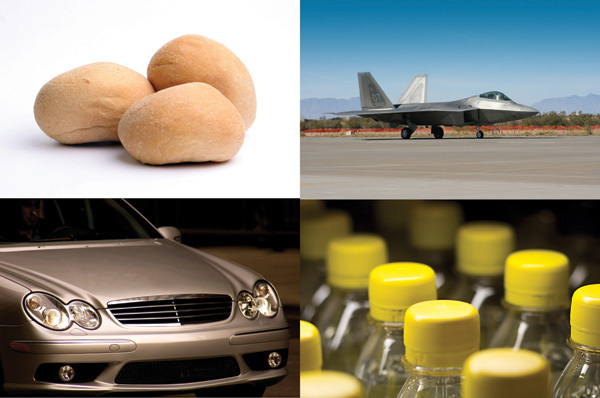 The smallest possible amount of lubricant is used to avoid product contamination. The aerospace industry adheres to the highest standards of quality and reliability. Ultra-Micro® PurgeX® is used in assembly operations because it is proven to dispense the exact same amount of lubricant over millions of cycles. Ultra-Micro® PurgeX® is an integral part of achieving zero defects in these environments. Oil-Rite's extensive online catalog features detailed information and images of each item! 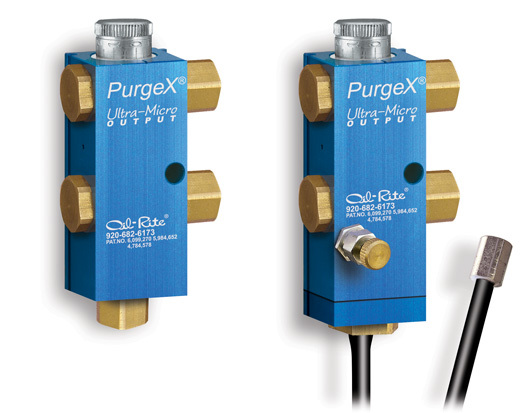 Click here to start exploring configurations of Ultra-Micro® PurgeX® for use with liquids. Ultra-Micro® PurgeX® for use with grease applications can be viewed here. This hydroelectric dam utilizes Oil-Rite lubricators. The customer initially purchased oilers from a different company and experienced recurring leaks. The suppliers replacement parts were complex to install, not easily obtained, and did not offer a permanent solution to the problem. A purchasing agent worked with one of Oil-Rites technical sales representatives to determine the kind of lubricator best suited to the application. Single feed electro lubricators were selected. Lubrication occurs when the solenoid is activated, making the unit especially suitable for intermittent operations. The specific model chosen features a durable and economical 1 quart, polycarbonate reservoir. The clear reservoir allows for easy liquid level viewing. The reservoir and sight are vented to allow liquid to flow by gravity. An adjustable precision needle valve is provided to control the flow rate; it has a friction lock to guard against loosening from vibration. Drop feeding is observed through the glass viewing window in the valve body. The unit features a threaded shank for mounting to a bracket. 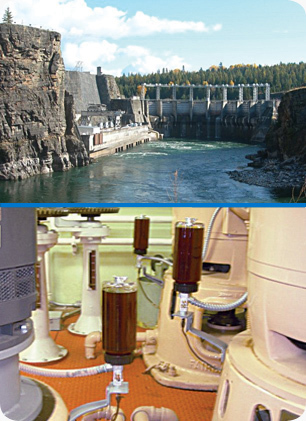 This photo shows Oil-Rite lubricators installed on the hydroelectric dams primary pumps for water-power generation. Since purchasing lubricators from Oil-Rite, the customer has had no costly reservoir leaks and is very satisfied with the performance of the lubrication equipment. Oil-Rite offers an extensive variety of gravity lubricators, suitable to a wide range of applications. Click here to view detailed product descriptions and photos of each item in the online product catalog. Escalators are expected to run for long periods with little intervention from maintenance individuals. One of the primary requirements is consistent lubrication of the chains that drive the steps and hand rails. A customer came to Oil-Rite Corporation looking for a precise and reliable method of applying lubricant. They utilized a motor-driven PurgeX unit with dual feeds. One feed supplied oil to the step chain and the other to the hand rail chain. Both outputs are independently adjustable for the amount fluid dispensed with each lubrication cycle. The steady flow to nylon brushes supplies oil over long periods from a ½ gallon reservoir attached directly to the PurgeX pumps. The system operates only when the escalator is moving and there is no residual drip with PurgeX. The system is clean, efficient, and extremely reliable. It is built with standard components and does not require specific lubrication knowledge to install and operate. 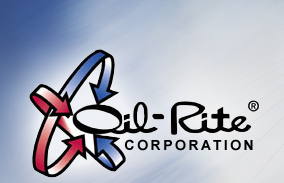 Contact Oil-Rite Corporation for a referral to this company that designs, installs, services and modernizes transport systems. I would like to let you know that the PurgeX lubricator is the most reliable lubricator I have ever used. I was fortunate enough to introduce these lubricators at our company a few years back and they have earned a great reputation for their maintenance free performance, which in turn made me look like a smart cookie, thank you. We have many of your units in our facility that have been in constant operations with over one million cycles and they have worked flawlessly. The amazing thing about them is that we use a water soluble oil mixture as the lubricant in our stamping process and as the lubricant mixture sits it often separates out and/or loses its viscosity requiring the lubricator to pump through this which it does. Other lubricators would get clogged, gum up, need priming, weep, require maintenance or complete replacement."